THE SMALL FACES: OGDEN’S NUT GONE FLAKE: 1968: 4 STARS OUT OF 5 STARS: Rating may change with more listens.. Ogden’s Nut Brown Flake is a tobacco….The Small Faces have been called one of the greatest British bands never to make it in the US. Favorite songs here on first listen- Ogden’s Nut Gone Flake, Rene, Lazy Sunday, Afterglow Of Your Love. Will have to spend more time with this one for sure. 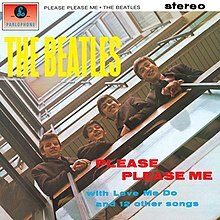 THE BEATLES: PLEASE PLEASE ME: 1963: 5 STARS OUT OF 5 STARS: I haven’t listened to all the Beatles albums in order in a couple months- time to start through them again! A great debut! These guys just might make something of themselves. The cover of Twist and Shout is a real potboiler! in the evening sat outside and listened to the three hours this week- of the Neon Beat on Radio George. Some good songs… remember Steve Marriot well, a “Mod” icon in the 60’s… love their (Small Face) “All or Nothing”. I need to listen to more of them! I like this album on first listen.